Natasha from TheTownBlogger nominated me for The Liebster award. She has a lovely blog please check it out! 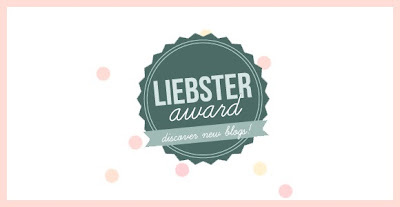 This award is directed toward bloggers with less than 200 followers that deserve more exposure. It's also a great way for new bloggers to become part of the blogging community. Thanks again Natasha. 3. You must pick 11 bloggers to be nominated for the award with under 200 followers. 1. What is your favorite makeup product? Gold Deposit by MAC! I swear I can't live without it! I know this sounds kind of cliche, but MAC is my favorite. I get excited when they release a new collection. I don't think anyone approaches selling products the way MAC does. The quality of their products are unbeatable, and I love how they appeal to almost any age group. 3. Favorite Month/time on the year? June is my favorite month. My birthday happens around that time, it's the beginning of summer, everyone's at the beach! I love June! I want to see Paris and Greece at least once in my life. 5. Do you prefer sweet or savory food? I prefer any food to be completely honest with you. I don't have one favorite Youtuber, but I do enjoy watching Ambrosia (Xgoldn) and Socialite Sandy! I listen to all types of artists. I don't have a favorite. I would love to publish my own magazine, work for a reputable radio station as a personality, and do fashion broadcasting. 11. Do you own any pets? what are they? No pets. I'm not an animal person. 1. Name your biggest inspiration. 2. Where do you see yourself in the next 10 years? 3. What's your favorite lipstick? 5. What's your favorite hair product? 6. Explain your signature style. 9. Finish this sentence. I cannot leave the house without ______. I just saw the post! :) Thanks again!